We usually don't like to divulge our sources here at the CCPS, but we'll share one secret with you: we keep the Bell/Simm Play compilation close by our fingertips at all times, as it's proved to be a fantastic source for sorting out some of the players in mid-90s indie rock. One of the pieces it's helping us sort out today is the mystery that is this extremely brief tape. 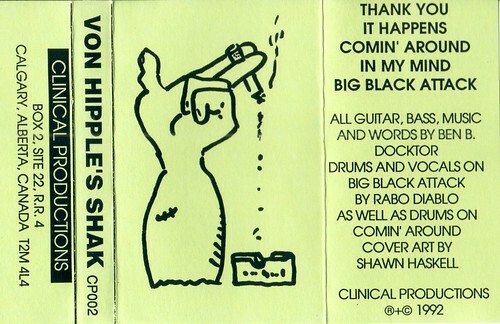 Von Hipple's Shak is basically Ben B. Docktor, who would go on to play with Drench. Their track on Play feels like it's about as long as this whole tape. Which you can grab here, 'natch.